C-Trak can assist you with your television adverts and game shows with a range of conveyors for all application including roller, belt conveyors as well as travelators. The BBC use to hire it out week after week for the very successful series. It use to be the number 1 game show on a Saturday nights back in the 1970s, and is said to have had audiences of over 21 million. Where did the Conveyor Belt Come from?? 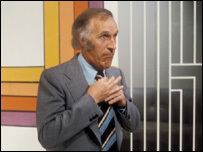 Well C-Trak Ltd are the company that manufactured the original conveyor belt for the Bruce Forsyth Generation Game. It featured 4 couples competing in challenges like clay pot making or sword fighting to completely humiliate themselves in public. Bruce Forsyth now in his 80’s currently presents Strictly Come Dancing on the BBC. C-Trak would like to wish him well and ask if he ever needs a Conveyor Belt he knows were to come!! Of Course C-Trak have much improved its Conveyor Belts since the 1970’s and we pride ourselves on the quality of our craftsmanship.